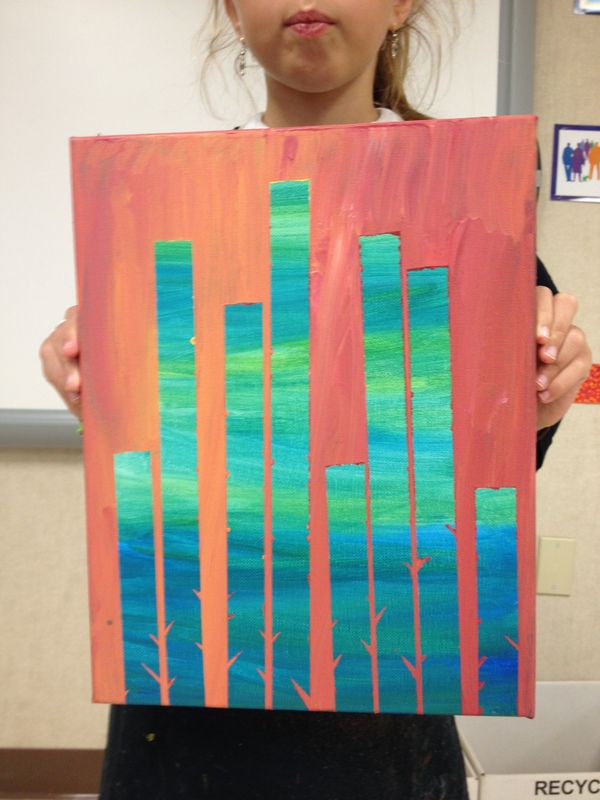 This project turned out to be a great starting point for my young students to try out acrylics and also learn some elements of design.This lesson took 2 classes (each class is 1 hour long) to complete. I used 9/12 inch canvases and acrylic paint. I loved how it shows positive and negative space, and also how lines can create illusions. It was a perfect idea for teaching those elements of design. I also saw a way of introducing contracting colors along with warm verses cool colors. 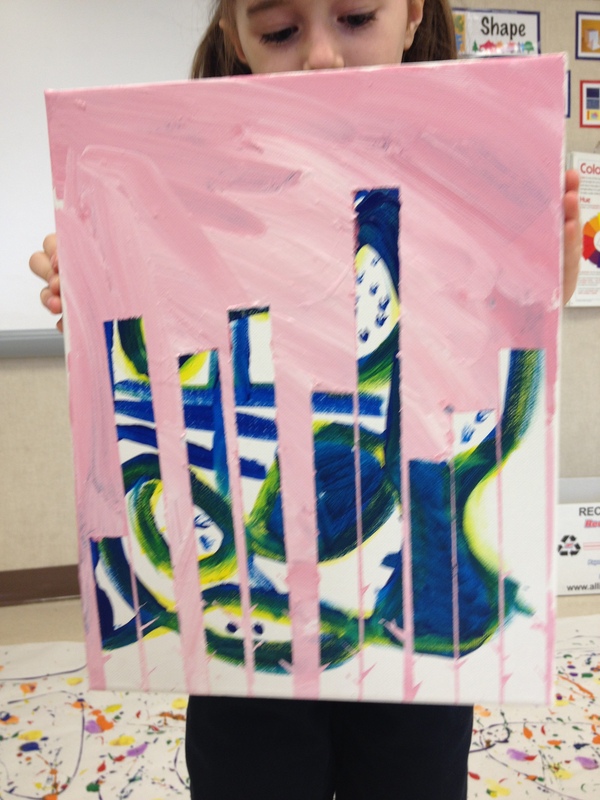 I had seen several ideas of using masking tape in acrylic painting and realized that would be an easy way for my elementary students to accomplish this painting, and also teach them a cool trick. We started with a cool color background. I let them fill the blank canvas any way they wanted. I told them to have fun and do any sort of swirls or stripes or dotes inspired them. I demonstrated using blue, and painting horizontal strokes while adding yellow or white in every few strokes. 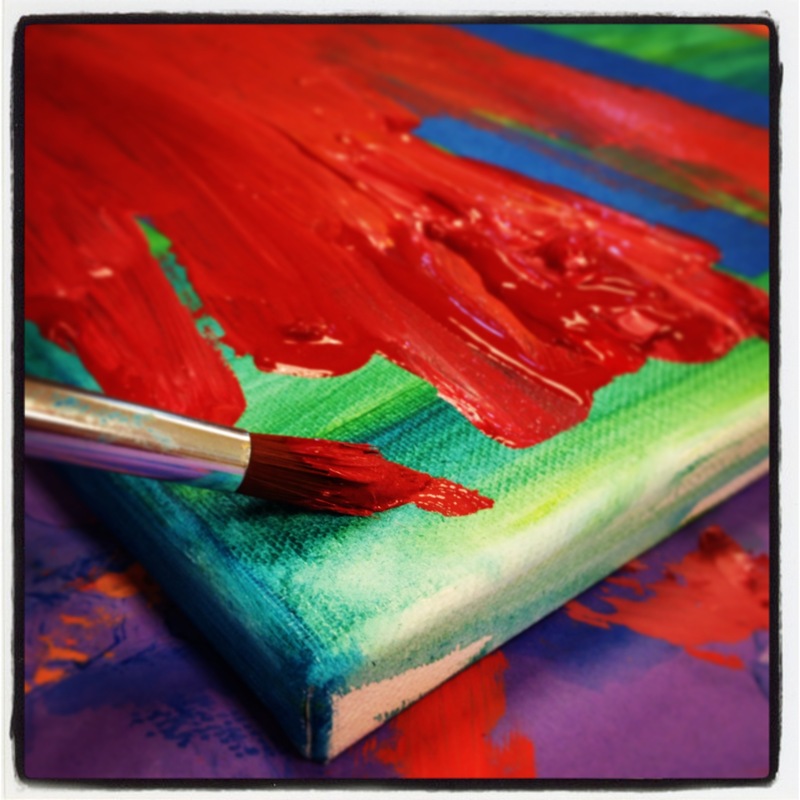 I also included a talk about how you can mix paint on a pallet, and you can blend paint on a canvas in a similar way, depending on how many strokes you use. 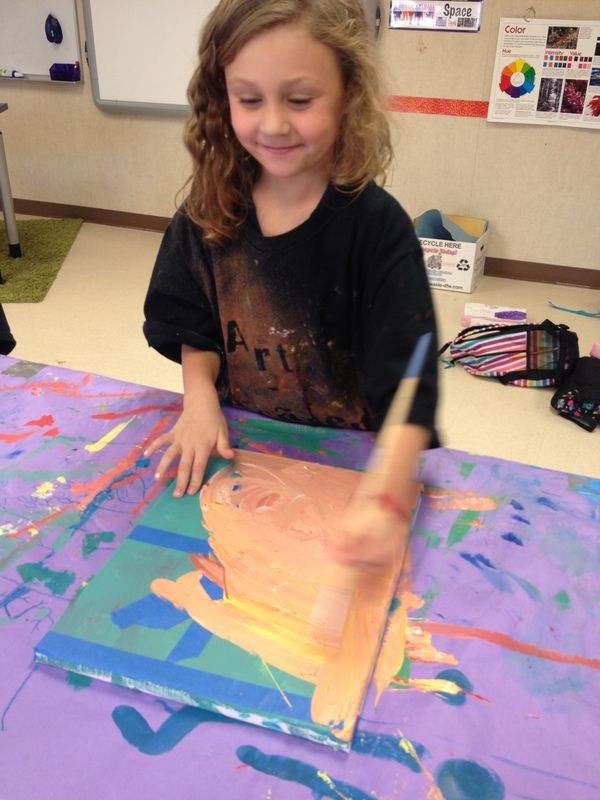 It was a great experiment for them to figure out how to blend colors without over blending. The next class we finished the painting. 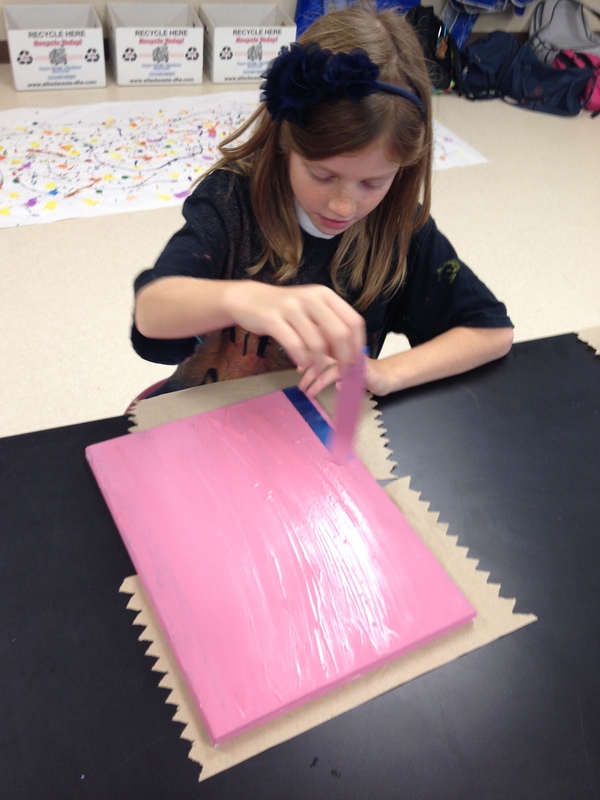 We started out by placing masking tape on the canvas. I pre-cut the tape so that we had time to complete it, but for older kids it would be easy for them to cut their own tape. I made sure each edge was nice and neat with square corners. I then cut wedges along the bottom sides of the tape (to give the illusion of branches latter). I encouraged them to place the tape about an inch apart, and to have some closer together and some farther apart to give it a more natural feel. I found it is important to go back and make sure the tape is on good, or paint will sneak under it. After the tape is on, its time to do the top coat. 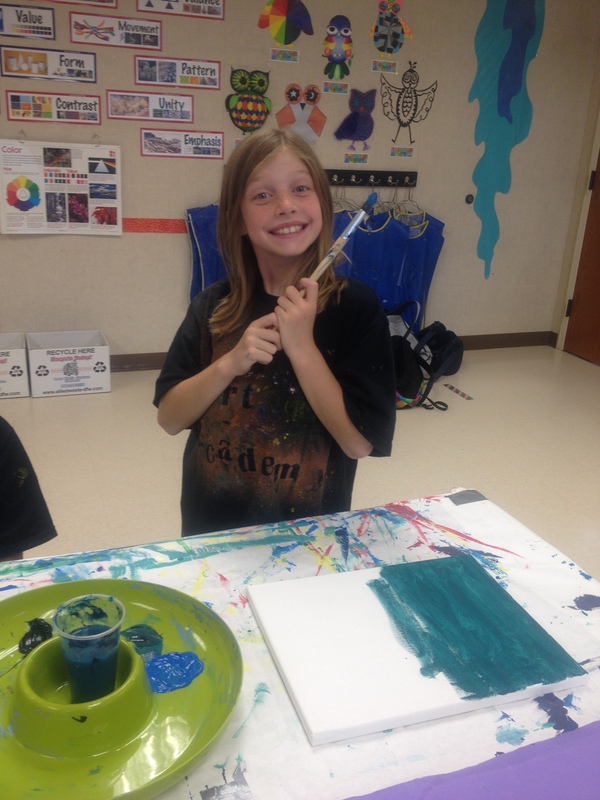 I showed them how to have a gradual color change by starting with a red at the bottom or top, and blending in yellow and white till you get to the other end. It gave their paintings a nice sunset look. Each painting was unique because of their individual backgrounds, but they all accomplished the desired look.